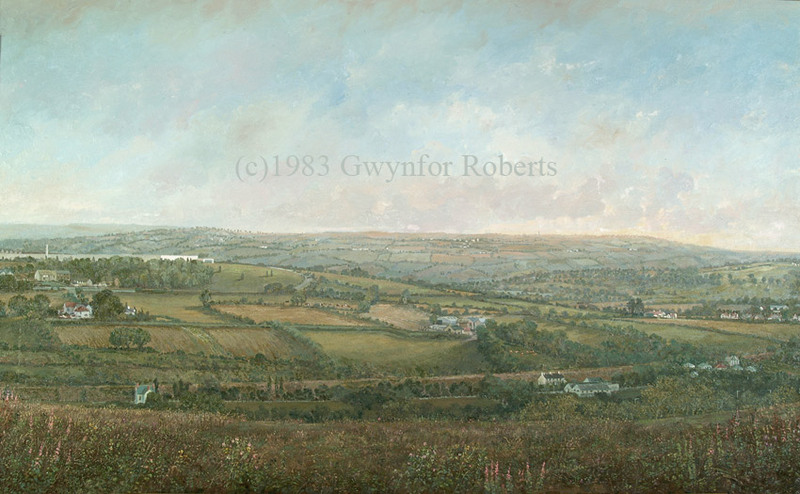 I lived in Cefn-Hengoed for 20 years and this view is just 2 minutes walk from our house. This was painted in 1983 and the landscape is the same today. A number of details shown in my sketchbook page are to be found in this painting : Ty Howell Fechan Farm - The Coal Hole Inn, Gellihaf - Gellihaf Isaf Farm. The detail below is the original sketch from 1983 for the main oil painting above and it consists of six A5 sheets of paper. As you can see I made the silly mistake of using a cheap tape, hence the brown marks. The four paintings arrived here yesterday. They are lovely and I am so pleased to have them. I have a Welsh wall in the hall and they will be put there along with family pictures and Welsh Love Spoons. I was so glad you identified the buildings in the picture of Summerfield Hall. I was wondering if the aqueduct between Hengoed and Maesycummer is still standing. South of Newport, near Goldcliffe, is a beautiful old house, Great Newra, which deserves to be painted. My great grandfather, Thomas Phillips, with his family lived there. Thank you so much for the beautiful pictures. I am just about to go out to get them framed.